As I get a bit more acclimatized to the French political scene, I’ve come to recognize a few differences that really stand out. One big difference is the limits in which the political discourse is situated. Let’s take the world socialist for example. In America, using the word socialist is pretty exclusively used as an insult, if any serious politician ever had any socialist sentiments they would be smart to keep it to themselves. In France however, the candidate from the socialist party is in the lead for the presidential race, and the socialist party isn’t even very far left. There is a communist party, and an anti-capitalist party that are both farther left than the socialist party. It seems like this would never come about in the U.S. Regardless of whether this is good or bad, the spectrum of political ideas is much broader here in France. I recently asked a french friend what he thought the general french opinion of communism was, he replied by saying that while it is considered an extreme approach, it is accepted as a possibility. I also just learned in my politics class that before the PS (socialist party) became the biggest party on the left, it was the communist party that had the strongest following. 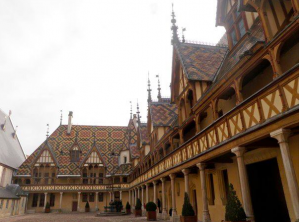 This past weekend our group went and visited Beaune, a town just outside of Dijon that is known throughout France for its exceptional wine. 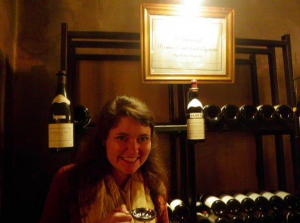 We tasted about eight different wines (Chardonnays and Pinot Noirs) and visited an old hospital that is now a museum. We got to see all the old tools they used to use to dig holes in peoples brains, it was pretty gnarly. Here’s a picture of Erin tasting wine. The metal cup in her hand is what is used to taste the wine; it has bumps and ridges on the bottom so that when the light reflects off the cup you can see the sediment from the wine at the bottom of the glass. My DYSE rating is getting much better, it hasn’t happened to me in a while. I still have one weakness however, and that is at the kebab stand. Everything goes smoothly until they ask me what kind of sauce I want. Twice now I’ve made the mistake of asking what kind of sauce they have instead of just pointing to a random one (getting an unknown sauce is better than being foreign!) The response I get sounds like a whirlwind. My dumbfounded face is met with a smile and a slow repetition of the sauces in english. The funny part is that most of the people working there don’t know the names of the sauces in English so they just say the color of the sauce in English. I pick a color, and with my identity revealed, slowly munch away my sorrow.